Description: This statue, a life-size bronze sculpture, memorializes the iconic historical military figure, Lieutenant General John Archer Lejeune. Archer is depicted in the dress of a Marine commander, following World War I, circa 1919. He stands with his arms raised, seeming to adjust his gloves. The statue stands atop an angled brick pedestal with a stone cap. A bronze commemorative plaque bearing the inscription is mounted near the top of the pedestal just below the figure. Unveiling & Dedication: The unveiling event was attended by Lejeune's grandson, retired Col. James Blair Glenn. Marine Corps Base Commanding General Maj. Ronald G. Richard gave a speech, and the event was attended by a number of military dignitaries including Marine Corps. General Michael J. Williams. Subject notes: John Archer Lejeune, the iconic military commander, was born in 1867 in Louisiana, the son of a Confederate Army Captain, and died in 1942. Serving in the military for a 40-year career, he lead units in multiple military efforts including the Spanish-American War, the Cuban Campaign, and World War I. He became the 13th Major General Commandant of the Marine Corps in 1920. Retiring from service in 1929, he subsequently became the superintendent of the Virginia Military Institute. He died on November 20, 1942 and was buried in Arlington National Cemetery. The Marine Corps base in Jacksonville, North Carolina was named Camp Lejeune in honor of the commander. The sculptor, Patrick Miller, depicted General John Archer Lejeune from a photograph. Archer was apparently putting on his riding gloves before a parade in New York City after returning from France following World War I, around 1919. Without using planned designs, the sculptor jumped straight into the full-size sculpture, casting it in clay. Six castings of the sculpture can be found throughout the U.S. One of the castings stands outside the birthplace of Lejeune in New Road, Louisiana. The donor, Patrick Taylor, was an oilman and philanthropist from New Orleans. 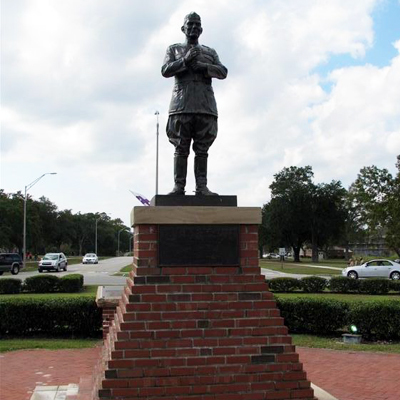 Location: The monument stands in the traffic circle at the intersection of Holcomb and McHugh Boulevards at Camp Lejeune. Landscape: The site is surrounded by buildings and open land.